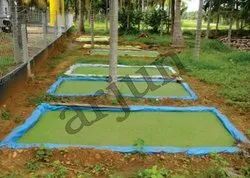 Prominent & Leading Manufacturer from Salem, we offer spirulina pond liners and azolla pondliners. We supply Azolla Pondliners which are made from PVC Coated fabric and they are done with special (Lacquering) Coating on the top and also they are UV inhibited for longer life under the sunlight. We supply Azolla Pondliners which are long lasting and durable.